I picked a handful of green beans today. You are saying to yourself at this point, "So what is the big deal that this deserves a whole blog entry?" 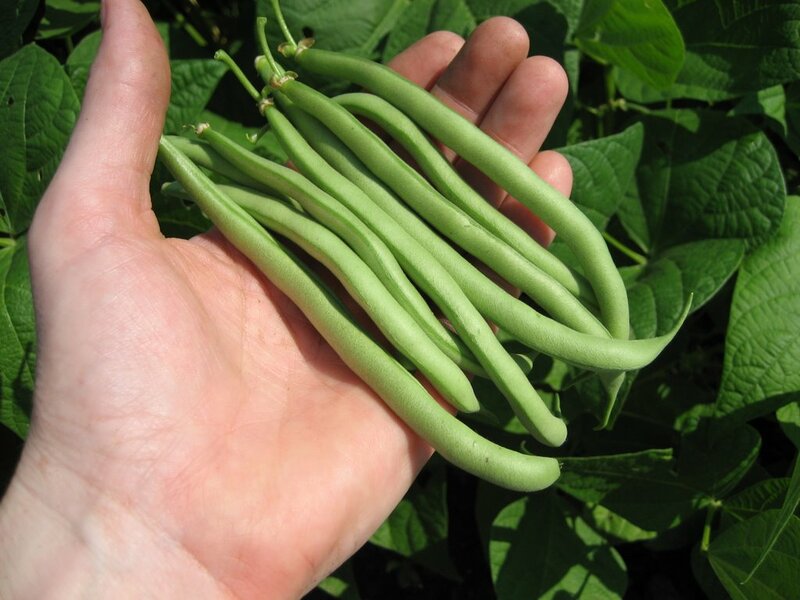 I agree that normally this would not be a big deal, because green beans are one of the easiest vegetables to grow. However, for the past several years, I have battled rabbits in the garden, and they have been winning. They would eat every bean plant I had down to nothing, nearly as soon as the first set of leaves appeared. I tried several types of fencing to keep the rabbits out. I tried trapping them live. I tried blood meal and cayenne pepper. I tried cursing. I even thought briefly about just not growing any greens beans, but I knew that I could not have a good Hoosier vegetable garden without green beans. I stopped just short of buying a spray that contained “putrid egg solids and garlic”, because after all, I wasn’t trying to keep myself out of the garden, just the rabbits, and it was quite expensive. Nothing seemed to keep the rabbits away from the beans. This year is different! I covered the beans with a white garden cloth until they got big enough to live through some rabbit munching. And, even though the rabbits ate the tops off the bean plants just a few days after I uncovered them, the bean plants survived and grew back, and flowered and now I have beans. With this simple method I and the rabbits can now co-exist, with enough beans for both of us. Yes, I have green beans. And, as a bonus, these beans have not been attacked by Mexican bean beetles. There is not a spot on them. They are nearly perfect! They are a triumph of me over the rabbits. I win! I win! As soon as I picked this little handful of beans, I washed them off and ate them raw, one at a time, like a delicious gourmet candy. They were good. I savored each crunch, I chewed slowly. I enjoyed these beans. I can now allow myself to hope for a bigger “mess of beans” to cook up soon. I am looking for a good recipe, the perfect method, to cook up my first batch of good ol' green beans. Any ideas? By the way, this is a picture of my garden this morning. A lot has changed since I planted it in late May! They look great, and it's funny that you are the one who ate them, just like the little red hen, "Who shall eat these beans?" 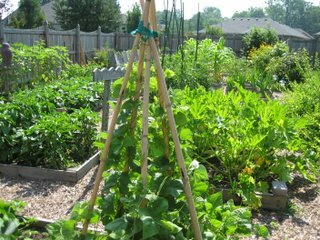 I looked at the May planting photo - your vegetable garden looks enormous. I'm betting you could fit 4 or 5 vegetable gardens the size of ours into that area... just how big a plot do you have under cultivation, please? Your garden looks great. I bet the beans tasted delish! 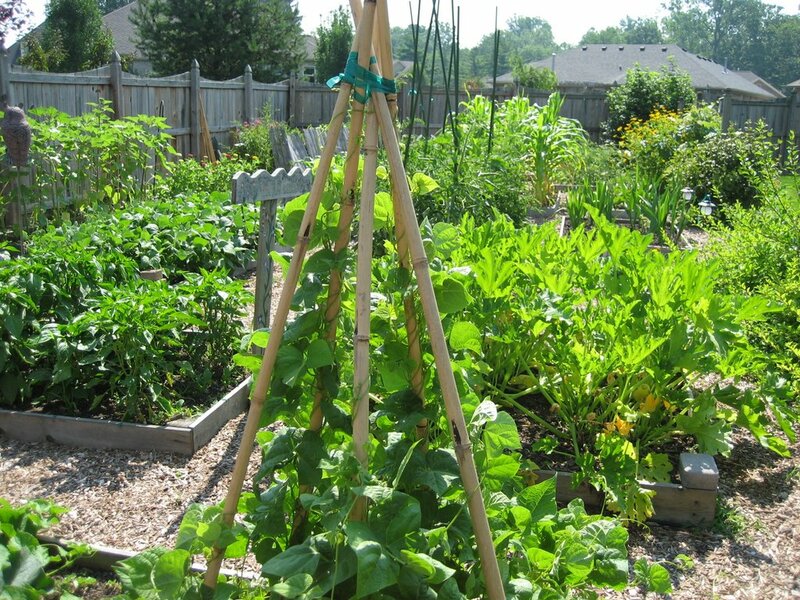 The entire garden includes 392 square feet of planting space. Thanks for the comments!